Our range of products include neem- o- rick herbal face wash.
Voted as first among the best, we provide clients with the premium quality of Neem-o-Rick. Prevents recurrence of pimples and blemishes, the neem-o-rick is processed under hygienic conditions at the vendors’ end. 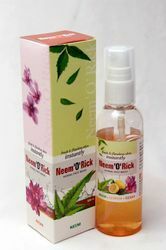 Moreover, the neem-o-rick is highly effective against different bacterial infections of skin. The neem-o-rick ensures radiant, healthy and glowing skin. For blemishing & improved skin tone ! ! Looking for Ayurvedic Face Wash ?